Brad Keselowski had won at Martinsville (Va.) Speedway before but never like this. Keselowski held off Chase Elliott by about half-a-second to take the victory in the STP 500 on Sunday, completing a dominating performance that saw him lead 446 of the 500 laps. Keselowski led more laps in Sunday’s race than in all of his previous 18 starts (437) at the track, which included one previous win (2017). 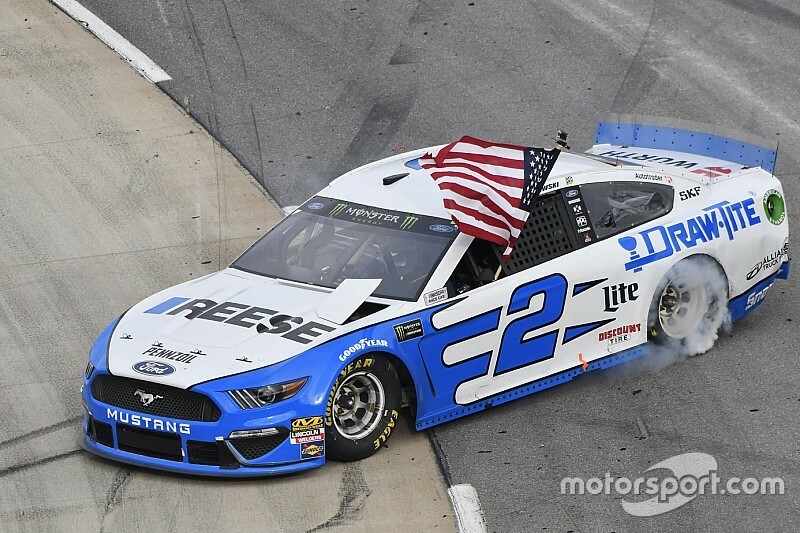 The win is Keselowski’s second of the 2019 season and 29th of his Monster Energy NASCAR Cup Series career. "This car was just awesome," Keselowski said. "Ford worked really hard in the offseason on these cars to make them strong and so far, so good. Great day for our team, awesome execution on pit road. "It was just one of those days you dream of as a race car driver. We had a great car. I don't know if we were as good as Chase Elliott. He was really strong and passed me with about 200 (laps) to go and I watched and studied him and broke it down into what I had to do to hold him off. "As the temps were cooling off, the track was losing its rubber and just losing grip. Paul (Wolfe, crew chief) went working on it the best we can and that's what this team does - it never gives up. I'm really, really proud of them." Kyle Busch finished third, Ryan Blaney fourth and Denny Hamlin completed the top-five. Rounding out the Top 10 were Kevin Harvick, Clint Bowyer, Martin Truex Jr., Aric Almirola and Daniel Suarez. Following the break between Stages 2 and 3, Keselowski was once again the first off pit road followed by Elliott, Bowyer, Truex and Almirola. The race restarted on Lap 272. Ty Dillon was penalized for being too fast on pit road and both Hamlin and Ryan Newman were penalized for having an uncontrolled tire during their pit stops. All three had to restart from the rear of the field. With 200 laps remaining in the race, Keselowski maintained a small lead over Elliott with Bowyer running in third. Hamlin remained mired in 18th after his penalty. Byron spun on Lap 313 exiting Turn 4, which brought out a caution. All of the leaders elected to pit with Keselowski the first off pit road, followed by Elliott and Kyle Busch. Bowyer was penalized for speeding on pit road and had to restart from the rear of the field when the race returned to green on Lap 320. On Lap 325, Elliott got to the inside of Keselowski exiting Turn 2 and took the lead for the first time in the race. After fighting a tire rub, Erik Jones finally slammed the backstretch wall on Lap 330 and slowly inched his way around the track and to pit road with no caution displayed by NASCAR. With 150 laps to go in the race, Elliott had moved out to a 1.3-second lead over Keselowski. Blaney ran in third, followed by Kyle Busch and Truex. Matt Tifft hit the Turn 2 wall on Lap 372 to bring out another caution. All of the lead lap cars elected to pit with Keselowski beating Elliott off pit road to reclaim the lead when the race returned to green on Lap 380. They were followed by Kyle Busch, Blaney and Harvick. Bowyer was again penalized for speeding on pit road during his pit stop and had to restart from the rear of the field. With 100 laps to go, Keselowski maintained a small lead over Elliott as Kyle Busch ran third, Blaney fourth and Harvick in fifth. Keselowski moved out to a more than 1.5-second lead over Elliott with 75 laps remaining in the race. Kyle Busch remained close behind in third. On Lap 446, Ross Chastain fell off the pace and his No. 15 Chevrolet came to a rest in Turn 2 which brought out a caution. All of the lead-lap cars elected to pit and Keselowski again was the first off pit road. He remained in the lead when the race returned to green on with 45 laps to go and was followed by Kyle Busch, Elliott, Blaney and Harvick. On Lap 458, Elliott moved around Kyle Busch on the outside and into the second position. With 20 laps to go, Keselowski maintained a small but steady advantage over Elliott with Kyle Busch running in third.